On May 12, 1897, many distinguished guests attended the formal opening ceremony of the Flower Observatory. Dedicated funds for the construction of this facility had been willed some twenty years prior by Mr. Reese Wall Flower. Though Mr. Flower had no formal connection to the University of Pennsylvania or to the hobby of Astronomy, he bequeathed nearly all of his estate "...to the erection, construction, and maintenance of an astronomical observatory." However, the relatives contested the will; the University was awarded only the ~100 acre farm and some other assets. The relatives got the rest. It has been suggested that Mr. Flower's generosity grew from a nod to his ancestry. His great uncle, George Graham, had been an astronomer in London. 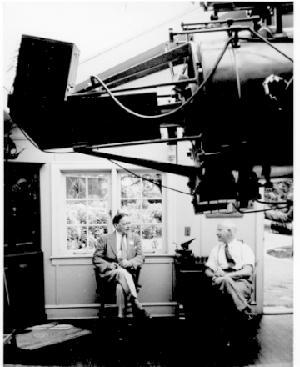 The establishment included three buildings on the Flower farm in Upper Darby and employed an 18" aperture Warner and Swasey refractor (with a Brashear lens) as its workhorse. One of the three buildings was devoted to making precise position and timing observations of stars. Thus, it contained several astronomical clocks, a prism transit, a meridian circle and (c. 1906) a zenith telescope. Meanwhile, in nearby Lansdowne, PA, avid amateur astronomer and wealthy Philadelphia businessman Gustavus Wynne Cook was busy setting up an observatory in his own home. During the depression, he moved to an estate in Wynnewood. There he constructed two entire buildings to accomodate his hobby. The 8" aperture Clark and Sons refractor purchased as his first telescope years earlier made way for a 28.5" reflector (J.W. Fecker Company) and a unique 15" siderostat refractor (Brashear lens, Fecker mount). The 8" lens was extracted from its original tube and outfitted in a Fecker mount as a finderscope piggybacked to the huge reflector. Mr. Cook set the original tube aside in a copper bathtub on the second floor of his coach house (garage). The Roslyn House Observatory operated for approximately ten years (~1929 to 1940), conducting a program of photometry and spectroscopy complementary to astrometric work at Sproul Observatory on the Swarthmore College campus. Thanks to its wide assortment of cameras and telescopes, this observatory became respected as one of the best equipped amateur observatories in the world. When Mr. Cook passed away in 1940, he left all his astronomical instruments to the University of Pennsylvania. Simultaneous with the completion of the new Physical Science Building (later called the David Rittenhouse Laboratory) with its rooftop observatory in 1954, the 8" Clark lens and its tube were rediscovered. While the larger telescopes from the Roslyn House Observatory were scheduled to move into a a new off-campus facility in Williston Twp. (Chester County), the 8" Clark telescope had nowhere to go. Its mounting was located in pieces in the coach house at the Cook residence, and soon the whole assembly found a new home on the roof of DRL. Drs. F. B. Wood and W. Blitzstein brought the Department of Astronomy into the 20th century. In 1956, they designed and oversaw the construction of the new off-campus Flower and Cook Observatory with funds from the sale of the Flower Observatory property. They made improvements to the on-campus site also; they equipped the 8" telescope with an electric motor drive still in use today. In the late 1940's, Charles P. Olivier, then Chairman of the Astronomy Department and Director of the Flower Observatory, urged the University administration to purchase a plot of land in Willistown Township, Chester County, bounded by Providence Road and Warren Avenue. The Flower Observatory site was to be abandoned, the Flower Telescope and auxiliary equipment to be stored, and the land and buildings to be sold. The proceeds from the sale were to be used solely for the construction of a new observatory at the site near Providence Road. Today, the observatory employs the 72cm reflector (pictured above c. 1962) and the siderostat (below), both from the Roslyn House Observatory, as its workhorse instruments. (right)The siderostat of the Roslyn House Observatory c. 1935. This fixed, horizontal telescope receives light by reflection from a rotating flat mirror. 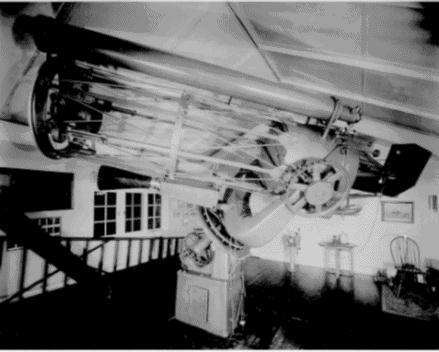 (above left)A view from above the room in the Roslyn House Observatory where the siderostat was stationed. (below)The eyepieces of the siderostat; on the left is the finder, on the right is the main eyepiece. Note the elegant dangling light for the observer's convenience (c. 1935).